Files or folders must be shared in order for others to view them. Yandex.Disk lets you generate a direct download link for each file or folder. Any files and folders in the Disk root directory or your personal folders can be shared. To share an email attachment, copy it from the Mail attachments folder (on the Archive tab in the left panel) to the desired Disk folder. Attention. You cannot share a file or folder located within a shared folder if you do not own it or have read-only authorization. The shared file link will continue to work until you make the file private. Disk will generate another link if you decide to share the file or folder again. If you already have access to a shared file and the Yandex.Disk web app or mobile app sends you another public link to it, it will be the same link that was generated when the file was shared the first time. 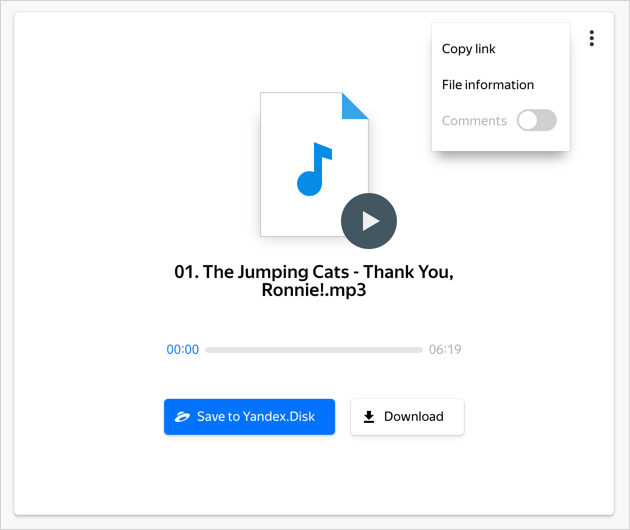 If you share a file or folder link with other Yandex.Disk users, they can view and save your file or folder to their Yandex.Disk. In the left panel, choose the Shared access tab. Go to the Links tab. Select a file to share. Click the Share button on the upper panel or in the context menu. Choose the link sharing option from the list: copying the link, sending it by email or posting it in social networks. To get a QR code link, select the appropriate menu item. Select the files or folders and tap Share. Choose whether you would like to send the link by SMS or copy it to your clipboard. Select the necessary files or folders and tap Share. Select how you would like to send the links to your files or folders. You can share a file or folder using the “Yandex.Disk” web app. Just get a public link and follow the instructions for Windows or Mac OS. Users with access to a shared folder can leave comments, reply to them, and add Likes or Dislikes to the published files and comments. If someone Liked or Disliked your shared file or left a comment, you will see a pop-up notification in the upper right corner of the screen. This information will also appear in your list containing all your notifications. To view all notifications, click the icon. Open a shared file by clicking on the link that was generated. Click the icon in the upper right corner and turn off the Comments option. Name (to change it, click → Rename in the upper panel or from the context menu). Number of files (for a folder). Number of views and downloads (for a shared file or folder). To keep public file pages without ads, connect to Yandex.Disk Pro.